Jose Mourinho is the John F Kennedy of football mangers. The clearest illustration of the charismatic personality in a sport not lacking in charismatics. The similarities to the stories of David Beckham and George Best are worth noting. According the mythologists, the story draws on deep and commonly shared beliefs about ourselves and our world. It speaks of our acceptance of powerful forces guiding our destiny. The most powerful stories are told and retold down the ages. They can be found in Greek tragedies, in Celtic and Norse sagas, and also in the campfire tales of ancient peoples. The central figure is heroic. Destined to succeed spectacularly, and then fail spectacularly. The message is that the special ones may appear to have been blessed, but whoever is out there doing the blessing also wants to remind us that humans at some point have to come to terms with their limitations. The special gifts of the charismatic include that of captivating those with whom they come into contact. We still use the old terms such as ‘spell-binding’ about their acts and speeches. 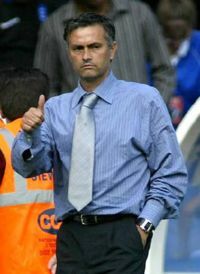 Jose was fated to lead Chelsea to success, as he was fated to win the European Cup with Porto, a team hardly considered capable of it. Charismatic leaders have that effect on followers. The spell makes then capable of achieving things they would otherwise have believed to be impossible. Those who come to mock often fall under the spell, but may fight against it. So it was that Mourinho even captivated the skilled and wilful members of the English Media legions, although there were those waiting, waiting patiently for the story to end in tears. However, the spell retains its potency. Even when there are signals of a different reality, there are cries of denial. Jose has a contract to 2010. He will be staying at Chelsea. Thus spake Peter Kenyon on behalf of the club. But the fact he needed to make such an assurance was significant. Perhaps sensitized by the week’s financial denials and reversals of policy by the Government and the Bank of England, I was not convinced by the spokesman on behalf of the Chelsea financial empire. So much so that I found time yesterday to update an earlier post, on the likelihood of Jose leaving the club. As is it with Jose, so it was with David Beckham and George Best. Their stories have similar ingredients of great giftedness and achievements accompanied by reminders of their fallibility, and potential downfalls. All achieved world-wide acclaim. All suffered. I will spare further links to the stories of the great Achilles or the original Hero. Jose and David still may have opportunities for further episodes in their reworking of that ancient story. Speculation has been rife for nearly a year that Jose Mourinho will lose his job as Chelsea Coach at the end of the season. CEO Peter Kenyon announces that Mourinho’s job is safe. So why is this unlikely to end speculation? The question takes us into the matter of how leaders in general may fail to convince the press and the wider public of their integrity. When a politician says “I’m not standing for leader” the message is rarely taken at face-value. I’m most familiar with the UK scene, but it seems a pretty universal reaction. We assume that the politician will find wriggle room so that the original statement did not mean what it sounded like. I suspect that there is widely shared tacit knowledge that the politician is saying something he wants us to believe, while reserving the right to claim that something else was meant, if and when that becomes convenient or necessary. There have been no press stories to indicate that Kenyon habitually misleads the public in his public statements. Yet, my suspicion is, that there is something in stories about Mourinho’s future. An earier denial by team captain John Terry did not not prevent the rumors from continuing. The Press is discounting the public statements without having prior cause for doubting the spokesmen. One broader issue is the attraction to many journalists to keep a good story running. Some have made claims to know that JM is going, with ‘exclusive’ claims that yet another international coaching star has been approached. (Germany’s coach Juergen Klinsmann is the latest of a long line of heirs apparent). There’s little follow-up mileage in a headline that says ‘Jose to stay’. Maybe this kind of wish from journalists helps achieve self-fulfilling prophesies from time to time. It probably contributes to the uncertainties and insecurities of high-profile jobs. But one factor is hardly enough to explain everything. It pays to look more widely. In Football, the club owner is often one major factor in the coach’s survival. In the case of Chelsea, owner Abramovich has about as much power as any one person can wield. Whatever Kenyon says, even if Jose’s got a contract to 2010, and even if he has the full support of the board today …. well, you can fill in the dots for yourself. How about ‘things might change if Chelsea fails to win the European Cup, or the Premiership, or the FA cup, or any combination of the three’ ? Abramovich’s reluctance to talk with the press simply adds to speculation. Mourinho’s leadership record at Chelsea over the last three years has been outstanding. Before his arrival he had already established himself as one of the most successful coaches in world football. This gives credibility to his somewhat ironic self-description as The Special One. He has recently made it clear that he would like to stay at the club, implying that the decision to leave would not be his. Leadership is often said to be the process of influencing others in seeking to achieve one’s goals. An important aspect is shaping the sense that others make of critical situations. Kenyon would like to reassure fans, as well as the media, that there is no ‘Jose Mourinho problem’ at Chelsea. We have also seen how such a statement may not be taken on trust. In some contrast, Jose Mourinho seems to be achieving that precious asset in his relationship with his players. He has communicated his belief that the players, too, are ‘special ones’ . When needed, a half-time reminder from the Coach (coupled with shrewd and sometimes daring substitutions) has resulted in the second half, a return to the high levels of performance demanded of the players. Charismatic leaders achieve their results partly through a form of unconditional trust that they induce in followers. ‘Less special ones’ have to rely on force of argument, often against the reluctance of others to believe what they are being told. We should take a look at the pattern of behaviours of the actors in the past. Kenyon has tended to be a ‘safe pair of hands’, perhaps tending to a parsimony in revealing and addressing inconvenient information. Abramovich has tended to achieve his results in a discrete fashion. Mourinho has tended to push his employers to get his own way, and has been known to put his job on the line to achieve what he wants. Which suggests that if and when Mourinho leaves, it will hardly be a case of ‘going quiet into that good night’. Correction, but is it better? The entry was modified to eliminate the earlier misspelling of Jose’s name. It originally referred to someone called Mourhino. I was tempted to retain the accidental error, but decided it was a bit of cheap and accidental graffiiti and maybe it explained why the post was not being hit very often (message to othe dyslectics out there …). A bold general may be lucky but no General can be lucky unless he is bold. The military precept has been adapted to explore the current disappointing performance of the Arsenal Football team. We ask whether the principle has any validity – in football or in military conflicts. The excellent title to an Arsenal football blog post set me thinking. Where had I heard that before? Napoleon? The author of the Herald Tribune report traced the quotation in his title to the British Field Marshall, Archibald Percival Wavell. The Arsenal blog picked up on it a few years later. It did sound a bit like a Napoleon story. That greatest of French military leaders was an early proponent of spin, so we have to be cautions about his words and intentions. There is a possibly apocryphal story of how he would consider the prospects for a junior officer by musing ‘Yes, but is he lucky’. The story fits with Napoleon’s somewhat fatalistic view of events which was coupled with a belief that there is a critical moment in battle (if not in life generally) when a great leader can seize the initiative regardless of circumstances. Which story brings us back to the excellent Arsenal blog by Yogi’s warrier. I’ve noted earlier that Arsenal is well-served by intelligently written blogs It must have something to do with the civilizing impact or the other great French General, Arsene Wenger. Yogi’s warrior bemoaned Arsenal’s bad luck this season, with injuries to their main players, particularly their peerless Thiery Henry. Seems to me, that luck deserves closer attention than it has received by academics, who would much rather study risk and uncertainty. With one or two exceptions, serendipity is out there with psychic studies as of dubious pedigree to warrant serious academic attention. Among the less cynical was the celebrated sociologist Robert Merton who suggested that luck could be partly explained by superior sensitivities to unexpected and unsought opportunities. I don’t think it is a coincidence that the ‘lucky General’ in the Herald Tribune story was none other than Jose Mourhino. Nor that the ‘lucky’ substitute was Didier Drogba. The win over Arsenal was about the time when the public profiles of both these figures were on the up. Since then Jose’s Chelsea have won two league titles. Mourhino’s reputation has grown even more. Drogba has largely fulfilled the promise that his mighty transfer fee required. Even more significantly, Chelsea has also suffered ‘bad luck’ this year on the injury front. But this has been coupled by a remarkable number of ‘lucky’ wins. Although there has been talk of Chelsea losing momentum to Manchester United in the League, the gap in points between the two teams has remained almost the same over a period of several months. One possibility is that our beliefs are shaped by the sense we make of complicated situations, through what Herbert Simon called bounded rationality. Another factor is a tendency among one group of people to believe that they have little control over events, while other people believe they have more control over events. The positive mental attitude of the latter seems to work in a leader’s favor. So we collect events that conform to our negative beliefs, and assert we have been unlucky. It is likely to be the same mindset which leads us to attribute the success of others to their good luck. As I’ve probably written before, ‘either you believe you can or you believe you can’t. And in either case, you are probably right. Rationality is bounded (as Herb Simon taught us). Napoleon, and Jose, desplay the self-belief of charismatic leaders that transmits itself to their followers (and even to their enemies). It’s Paul Revere in reverse. English patriots are riding out to warn against the American forces threatening their homeland. Only this time it’s Americans advancing and winning the battles for England’s premier football teams. There are Russian forces too, but that’s another story. Will the victorious leaders win the support of the natives, or are we in for prolonged insurgent battles in the name of independence from the invaders? This week Liverpool FC was acquired by two sporting Entrepreneurs from America. The event met little resistance from supporters, in contrast to an earlier takeover at Manchester United FC two years ago. When two American sporting entrepreneurs took over Manchester United Football Club a few years ago, the fans rose up in a display of organized resistance. The initial reactions were intense suspicion that the move was the prelude to the destruction of the club in the interests of short-term financial manipulation. The more extreme predictions have not come to pass, and the club is experiencing an upsurge of results on the pitch. Boycotts by disaffected season ticket holders have been rather ineffective, as the enlarged stadium at Old Trafford since the take-over has regularly claimed Premier league record attendances. In England, changing financial requirements brought about by TV rights and product franchises, were increasingly forcing a generation of club chairmen to sell their majority holdings and control. But football’s more than a business – isn’t it? Much has been written about the intensity of the cultural identity provided to a region, by its football clubs. An earlier example in England saw fans of the ‘Old’ Wimbledon form a breakaway club as the original team was relocated to Milton Keynes. Thus the outcry at MUFC. But even before, there had been a relatively smooth transition at Chelsea FC, during which fans quickly accepted the potential of what was at first seen as an unlimited budget provided by Russian billionaire Roman Abramovich. 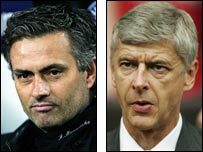 A succession of takeovers were to follow those at MUFC and Chelsea FC. At Aston Villa, all the dedicated efforts of Chairman Ellis in investing his own fortune in the club had cut no ice with the fans. The chairman’s commitment and willingness to fire the coaches he appointed had earned him his nickname of Deadly Doug. This probably helped reduce opposition to the take over at the club by another American sporting entrepreneur, Randy Werner. West Ham succumbed to offers from an Icelandic football administrator and retailing entrepreneur. Arsenal FC, one of the elite and revered names of English football, retained its broad governance, but at the cost of moving into a new stadium named after its backers, the United Emirates. What sense can we make of the reactions to the takeovers? At first sight it might appear that English football fans have become less susceptible to the ‘shock of the new’. This might have been because the governance at Chelsea and MUFC was seen to be, if not models of benignity, then were not as deviously short-term and threatening as the Paul Revere outriders were crying at the time. The threat of forein invasion is less acute elsewhere in Europe. Italy’s clubs remains beset with a range of problems which produced assorted punishments and leagl proceedings. Such turmoil did not prevent Italy winning the greatest prize of all, The last World Cup. Last weekend’s rioting was another eruption of the culture of football violence in Italy. However, Italy’s leading clubs tend to have backers of enormous resources and have have not been such an attraction for American sporting entrepreneurs. Nor have the clubs in Spain, which can boast two of the world’s most glamorous and wealthy clubs (Barcelona and Real Madrid). France and German clubs and also remain relatively untouched by foreign predators. Again wealth (Real) and interestingly democratic ownership (Barca) offer protection. Top teams in Germany and France likewise have resisted foreign invasion. First, that England, despite strong local culture in football historically, has been rather open to new ownership promising better success on the field. There is an interesting parallel with the openness to foreign ownership of commercial concerns, for example in the automotive industry. Secondly, the resistance will still vary according to local circumstances. You are currently browsing the archives for the Chelsea football club category.